The iconic design for a company building with a tower was first presented more than 50 years ago, but never realized. Architects Monovolume pursued the original concept and designed a flat, floating ‘wing’ with a six-storey tower. The powder-coated metal façade has 850 multi-colored, luminous window elevations arranged in pixel-like fashion. 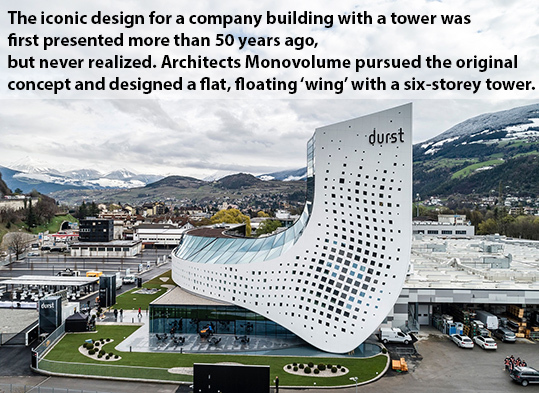 The pixelated facade of Durst’s new headquarters is also a pointer to the company’s areas of business, as Durst is a global leader in high-performance printing systems – from image data processing and printing to final product finishing – all from a single source. Durst employs more than 700 people and has more than 20 subsidiares across the world. Its history dates back more than 80 years is closely associated with the Oberrauch family, which is now in the third generation of ownership. The management board recently underwent a management change with Christof Oberrauch handing over the reins to his son, Harald Oberrauch. At the same time, Christoph Gamper was appointed CEO, and has now been given stronger ties to the long-established business through joint ownership. 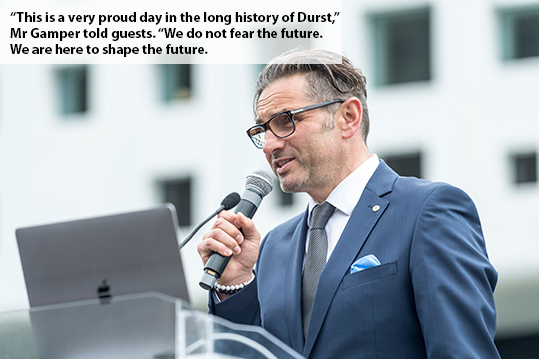 Mr Gamper has led Durst’s transition and introduced a new management structure and a new business philosophy: passion for technologies and markets, innovation as the driver, and active collaboration and participation in every area.